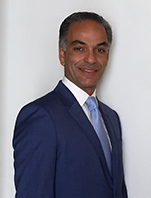 Nikos Hadjos is Director of International Hotel Development for Marriott International and is based in Athens. He is heading the development efforts of all Marriott's brands in Greece and Cyprus. Before joining Marriott in the headquarters for Middle East and Africa in 2013, Nikos worked for hotel investment companies in the Middle East such as Kingdom Hotel Investments and Abraaj Capital, as Vice President of Acquisitions, covering Middle East, Africa and Southwest Asia. Nikos has also held positions within the fields of consultancy with industry experts HVS in New York and operations with Marriott and Intercontinental in New York. He is a graduate of the University of Guelph, Ontario and holds an MBA in Finance & Investments from City University of New York. He is also a member of the Royal Institute of Chartered Surveyors (RICS) in the UK.